Who handles your trademark registrations? If you’re a sole proprietor, start-up, or small business, you might be personally responsible. The paperwork process to satisfy the federal government is hard enough without what I like to call “Trademark Bandits” making it more difficult. I recently received two official-looking pieces of mail addressed to me, with all my trademark registration information pre-filled on a very official-looking form. They were reminding me of my upcoming trademark renewal deadline. “How nice of the government to send a reminder!” you might think. WRONG! These are solicitations from Trademark Bandits. 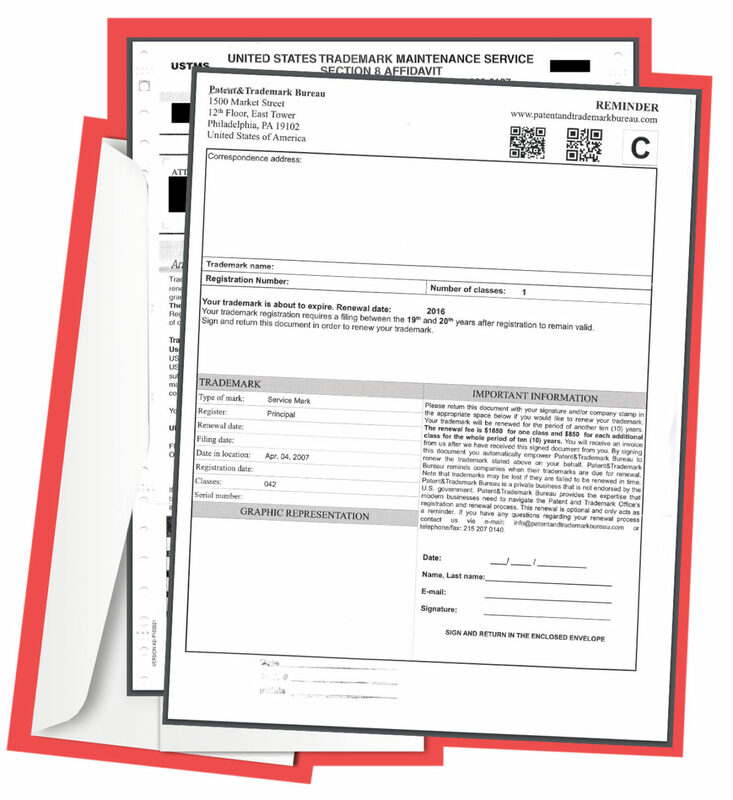 The form titles are things like, “United States Trademark Maintenance Service” and “Patent&Trademark Bureau.” If you’re not one for reading the fine print, you might complete the form, write your check, and send off what you think is the renewal for your trademark. What you’re actually doing if you send them money is signing up for a listing or reminder service that has nothing to do with the government-required renewal of your trademark. Important to read that fine print, huh? The amounts they are asking for aren’t small either: $619 and $925 for these two. See an example below of how one of these bandit mailings might look. Example of a fraudulent/misleading solicitation. Think you’ve been tricked by a Trademark Bandit? If you sent them money, unfortunately the USPTO can’t directly help get your money back. They aren’t an enforcement agency and can’t stop these companies from sending these solicitations. However, you can contact your state consumer protection authorities. The United States Patent and Trademark Office maintains a list of misleading companies and even shows examples of the mailings so you can confirm your suspicion. Watch this USPTO video about fraudulent solicitations. It’s pretty boring (and maybe funny depending on your sense of humor), but it might be helpful. This is the most helpful information from the USPTO related to Trademark Bandits. I hope you’ll share this with your network so we can help each other learn how to spot them. Note: Similar tactics are used by other private companies regarding domain names. If you receive a notice in the mail of renewing your domain name, BE SKEPTICAL! If you need help determining if these solicitations are real, Funnychord can help you. Contact us for a helping hand in catching these bandits.